Varsity Baseball Game originally scheduled for today April 5th at home, has been moved to West Linn High School. Game scheduled to start at 5pm, JV game will start directly after the Varsity game. Bus will leave at 3:20pm to transport the team to West Linn High School. Freshman Baseball game scheduled for today April 5th @ 4:45pm at West Linn High School has been rescheduled for tomorrow Saturday April 6th. Game time 11am at West Linn High School. Boys Varsity Tennis · Apr 4 Boys Varsity Tennis falls to Oregon City 6-2. The Home Freshman Baseball game vs West Linn scheduled for today April 3rd has been moved to West Linn. The new time is 6:45pm. The bus will depart at 5:30pm from Canby High School to take the team to West Linn High School. 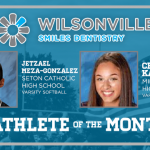 Cougars News · Apr 1 And the Wilsonville Smiles Dentistry Athlete of the Month is….